"This picture was taken on the roof of the Omni Hotel in Jacksonville, FL by the pool. My husband and I went to visit my sister, and it ended up turning into a MUCH longer trip than we'd planned on, but as long as you can go swimming with a view like this who cares, right?" So do they serve cocktails by the pool all night?! what a gorgeous view... must be so nice up there! That is a great place to put a pool. That looks amazing! It reminds me of the Standard in LA. Gorgeous photo. I could go for a little rooftop pool action right now! I haven't swam at night in ages!!! This makes me want to so bad! Right!! How gorgeous, I would have wanted to stay longer too! Looks amazing...can you please bring that back to Boston with you??? Oh like Lifestyles of the Rich and Famous-great view. very cute!!! I read her blog so I know what this is, so that's fun. Also- I wrote about you on my blog today- couldn't resist. this picture is so lovely and so romantic! Is there anything better than swimming at night? Beautiful! 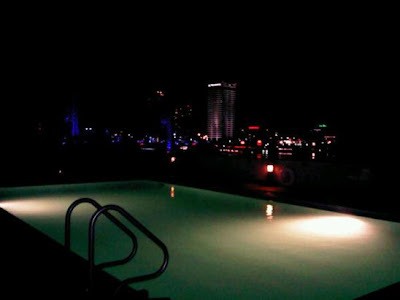 I would love to hang out at that pool... especially at night!